"The Science and Islam Video Portal is the result of research done June 2014-June 2015 into all videos on the internet that present information on both Islam (in any form) and the natural sciences. The research team selected a subset of the videos to evaluate further and have presented the results of these evaluations on this portal. The research project was crafted by Salman Hameed, the director of the Center for the Study of Science in Muslim Societies at Hampshire College. Dr. Hameed, who writes regularly on Irtiqa, has written about the understandings of evolution in Muslim societies. Joining him for this project was Vika Gardner, a post-doc research fellow, and fourteen undergraduate cataloguers from across the Five Colleges. In addition, the project had five advisors, two from within the Five Colleges faculty: Charles Ross, associate professor of evolutionary biology, Hampshire College, and Suleiman Mourad, professor of religion, Smith College. The other three bring a diverse array of knowledge about Islam, science, and history to the project. They are Ehab Abouheif, associate professor of biology, McGill University, Asad Q. Ahmed, associate professor of Arabic and Islamic studies, University of California, Berkeley, and George Saliba, professor of Arabic and Islamic studies, Columbia University." "Issue 32 of the Afghanistan Research Newsletter is now available on the Afghanistan Research and Evaluation Unit’s (AREU) website. Newsletter 32 is the second issue published since the quarterly newsletter was revived in 2015 and the first of many to come. Starting in March of 2004, AREU began publishing a quarterly newsletter with the goal of filling an existing gap in the availability of research on Afghanistan. The newsletter therefore was meant to provide much-needed policy and programming information to the burgeoning development community in Afghanistan, as well as the newly formed Afghan government. Originally intended to inform the research community of projects currently being conducted in Afghanistan and to facilitate communication between relevant organisations, over time the newsletter eventually focused on disseminating research findings on Afghanistan while also providing a categorical listing of new laws passed by the Afghan government. The newsletter contains a list of AREU’s publications released since the last edition as well as Afghanistan-related research conducted by external sources. However, following the publication of Newsletter 30 in the summer of 2011, AREU was forced to discontinue the newsletters due to a lack of internal resources. This hiatus continued until it was recently determined that within Afghanistan’s research climate there is still a need for the services formerly delivered by the newsletter, as well as a corresponding capability within AREU to deliver it. As a result, the newsletter will now be published quarterly for the foreseeable future." 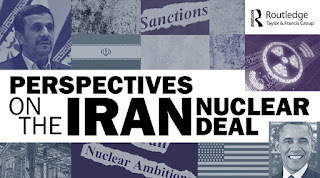 "Routledge have put together a research collection examining the effects of the sanctions on Iran and the impact that nuclear negotiations have had on Iran's relations with the US and other national authorities. It also explores Iran’s internal politics and foreign policy and the wider issue of Nuclear Weapons in the Middle East." The Special Issue of Near Eastern Archaeology: The Cultural Heritage Crisis in the Middle East (NEA Vol. 78, No. 3, September 2015) is now available without charge courtesy of ASOR. Seit 1998 wird das DFG-Sondersammelgebiet 6.23 Vorderer Orient einschl. Nordafrika von der Universitäts- und Landesbibliothek Sachsen-Anhalt betreut. Die digitalen Dienstleistungen des Sondersammelgebietes und anderer Informationsanbieter zur Schwerpunktregion Nahost sowie zum Islam sind seit dem Jahr 2000 in der Virtuellen Fachbibliothek Vorderer Orient MENALIB vereint. MENALIB bietet neben bibliographischen Datenbanken auch freien Zugang zu elektronischen Volltexten. Diese Volltexte sind als Teil der Digitalen Bibliothek der ULB Halle im fachlichen Repositorium der MENAdoc-Sammlung gespeichert. Sie umfasst neben einer stetig wachsenden Zahl digitalisierter Bände und Zeitschriftenhefte aus dem Bestand des Sondersammelgebietes auch frei zugängliche elektronische Volltexte zu den Schwerpunkten Nahost und Islam, die von unterschiedlichen Herausgebern im WWW bereitgestellt werden. All of these projects can also be downloaded to your hard disk or smart phone's sd card, for fast offline usage. Read below for more information on how to use this website, where to download it and other background information. Should work on most smart phones & tablets! The ambitious aim of the project is to understand the political and economic workings of a pre-modern empire, the Islamic Empire (660-940 C.E. ), which stretches over almost the entire Hellenistic-Roman world from the Atlantic to the Hindukush. In contrast to the conventional model of an empire founded on a religious revelation, the project is the first systematic attempt to explain the functioning of the empire from its regions and the brokering and management abilities of the caliphate with its various elites. While usually we have a top-down approach as seen from the center, this project takes the view from the regions, to explain the functioning of the caliphal government. The project looks at five key regions from North Africa to Central Asia, establishing their changing political and economic structures and chronologies, and identifying trans regional political, military, judicial, and indigenous elites. The tested hypothesis expects to see the central caliphal government in a more conscious role as moderator between the regions than has hitherto been recognized. In order to shift our understanding of the functioning of the empire from a chronicle-driven top-down view to a region-driven view, a multidisciplinary and multilayered approach seems to be most appropriate. Parallel to the literary sources, but independent from center-based chronicles and biographical dictionaries, sequences of coins (Islamic coins display up to 150 words, conveying mostly administrative information), the results of archaeological excavations, and regional surveys will be investigated. The study of elite groups connecting the regions with the center is another important element and will ultimately result in the creation of a prosopographical database. Emphasizing the role of the regions in the formation of the Islamic Empire points the view in a direction different from traditional 'Islamwissenschaft' which since its inception by Carl Heinrich Becker in 1910 has focused on Islam and its caliphate as the major formative force of the Empire. The Syriac Gazetteer is a geographical reference work of Syriaca.org for places relevant to Syriac studies. “Places relevant to Syriac Studies” include places named in Syriac texts (such as Ḥarqel — ܚܪܩܠ), places interesting to historians who work on Syriac texts (such as Dura-Europos), and places where scholarship on Syriac is being produced (such as Japan). There are no temporal or spatial boundaries for the geographic database, which collects places relevant to any period of history useful for Syriac studies, from places mentioned in the Peshitta version of Genesis to places founded recently, and from ancient Edessa to Mongol-era outposts in China and diaspora communities in the United States of America. At least in theory, any type or size of place could be represented in the geographic database, from large empires to single churches or a particular named city gate. Maps are provided for places whose location is known, but the database includes places which are not located or even locatable: each place is a conceptual thing with a mental existence related to, but not reducible to, its physical manifestation. Mythological and other ahistorical places are also included in the database. Index page: an alphabetic index of places in the gazetteer. About page: an overview of the gazetteer and its contributors. Help page: documentation, editorial guidelines, and technical definitions. Browse maps: browse places on an interactive map.